In the grand scheme of high-profile tech 'fails', the iPhone 6 duo's supposed susceptibility to bending remains relatively fresh in the mind. Though, in retrospect, issue only affected a couple hundred of the millions of early iPhone 6 owners, the internet did itself proud in ensuring the story grew into a meme, and subsequently, #Bendgate ensued. 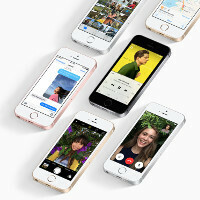 By the the time iPhone 6s and 6s Plus had made their way market late last year, most had long forgotten the early fanfare that accompanied their predecessors, though Apple still made some key design changes to bolster its latest and greatest. While the new iPhone SE is smaller and thus, in theory, should be less likely to bend, controlled tests show that the device is actually weaker than the svelte iPhone 6s in this department. Although Apple wanted to ensure that the 6s and 6s Plus did not re-ignite those Bendgate rumors, the just-launched iPhone SE is aesthetically based upon the iPhone 5s, which never had such reported issues. It would seem that the new 4-incher has been crafted in a similar fashion to the now-discontinued 5s, and whilst it is unlikely to bend in your pocket, SquareTrade's tests have found that it takes less weight to bend it out of shape than the current flagship. SquareTrade, being a warranty provider, carriers out methodical lab-style stress tests rather than the typically more arbitrary drop, scratch and torture clips we tend to see. Though the iPhone SE is thicker than its flagship counterpart, you'll see below that it buckles under 60 lbs (73 kg) of pressure -- 10 lbs less than the iPhone 6s put through the same test. Nah, you would really have to be doing something wrong to bend such a short phone. Yes. Go, go, go away fanboy. Why even attempt it when the shell is the same with the 5/5s. The is she'll has been on the market since 2013. The tech folks are real thirsty these days. Bend tests are stupid. The 6 plus had a genuine issue since that phone literally bent in pocket, but the hype surrounded gave rise to this stupid trend, which is pretty sad. Right off the bat, that test is inaccurate just like Consumer report's test. They should have tested the bend at the volume rocker button layout. That's where the structure gives out the easiest. It's also where the force from your pelvis and leg will bend it when seated with it in your pocket. Finally, that's also where bend tests have shown it bend at...﻿the iPhone 6+ has a flawed metal design. S6 edge is far stronger than iP6+. Please stop your blind live for Apple. Of course it will easily bend than 6s, which using recycle material. Glad of them still using 6000 series on SE. People won't understand this on this website. You're right. Unlike the iPhone 6 and Galaxy S6, the SE won't bend in normal use, just like the iPhone 5 and 5S didn't. You don't have to be a genius to figure that out, test the theory on a popsicle stick. The first snap won't probably take too much effort but try it again on one of the pieces you just snapped and it'll be much harder. You need to remove the galaxy s6 from your post, that was just Apple worshippers' butthurt response. S6 is far stronger. Also iPhone 5 used to bend in the past too.. see post 22. This is one of the companies we do insurance replacements for. SquareTrade have been testing phones like this for a while. When a new phone is released, ST tests them and then seens us the results which suggest which replacement parts we should stock the most parts for. The most common breaking point is obviously the front glass. Ever since the release of the S6 and Note 5, the front glass is still the most common broken part of those models. Mostly because many have placed a case which we know just covers the back. But we have had so far, far less frontal cracked glass on the S6's vs ther S5 and older S models thanks to GG4. But also, carriers have really been pushing for people to buy the 9H harden glass covers for the display. We actually received a brand new phone where it appears the user forgot they had a 9H screen protector, which was cracked. We peeled it off and the original glass was fully intact. Apple own ion glass is not as strong as GG4. Its also easier to scratch based on our own in-house testing. I thought it was weird that knifes and razor blades cause no damage to the iPhone 6S display, but I had a terry cloth I wiped the display with and it left faint scuff marks. Then I notice, there was some sand in between the fibers. Out of all the phones we service, which includes all iPhone starting with the 4S, Samsung's Galaxy S and Note, LG G3/4/5, Sony's Xperia Z, Nokia Lumia's8xx/9xx/7xx and HTC One and M series, the iPhone still leads the pack of being the most repair model. It also leads in customer who have broken the same phone more than once in a 12 month period. Remember, carriers insurance allows up to 2 replacements for a new phone, with most now charging as much as a $200 deductible. I recall myself paying $99 to replace my Note 4, but it cost me $200 for my S6 Edge. For what these phones cost, I dont see the benefit in using fragile materials for construction.